This novel won the Booker Prize in 1997, so I am somewhat tardy in reading this Indian author, Arundhati Roy, whose background interested me almost as much as the novel. She was born in 1961 in Shillong, Meghalava, India, to Rajib Roy, a Bengali Hindu tea plantation manager from Calcutta and Mary Roy, a Syrian Christian women’s rights activist from Kerala. When she was two, her parents divorced and she returned with her mother and brother to Kerala. In her early career, Roy worked in television and movies, but she became disenchanted with the world of films and began writing her first novel, The God of Small Things in 1992, completing it in 1996. 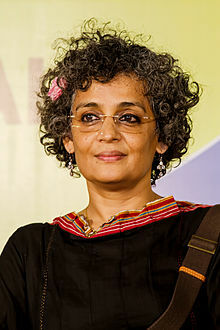 She has since written The Ministry of Utmost Happiness (2017), and a long list of non-fiction works, most of which seem to be associated with her advocacy work. Ms Roy has opposed India’s nuclear, industrial, and economic development policies, as well as US foreign policy, Israel, the Sri Lankan government, and numerous other initiatives. She has been a controversial figure in her home country. The God of Small Things was critically acclaimed by major newspapers in the US and Canada. Ms Roy received and advance of £500,ooo which, along with her prize money, she donated to her causes. The novel was a commercial success. Critical response in the UK was somewhat less positive, and the award of the Booker Prize was controversial. Carmen Callili, a 1996 Booker Prize judge called it ‘execrable’, and The Guardian said its context was ‘profoundly depressing’. I found the book neither execrable nor profoundly depressing, but I didn’t think it is extraordinary as the New York Times did. The book is set in the 1960’s in Kerala, India, and much of the story is autobiographical about a somewhat dysfunctional middle class family. The principle characters are young twins Rahel and her brother Estha, aged about 7, their mother Ammu, who is divorced, and their maternal grandmother, Mammachi. There are also Chacko, Ammu’s derelict cousin, his English ex-wife, Margaret, their nine-year-old daughter Sophie, and Chacko’s mother – the twins great aunt – Baby Kouchamma. Gradually emerging from the plot is Velutha, a Paravan untouchable, who is beautiful, competent and Ammu’s lover – the God of Small Things. There are some terrible things that happen: Estha is molested by a soft drink seller in a movie theater, the twins rebel and go into hiding, Sophie drowns, and Ammu’s affair with Velutha is discovered, but none of these events, in the context of India is depressing. All, with the exception of Estha’s molestation are the natural flow of events. As it is told, the assault on Estha seems largely preventable. The writing is certainly very clever: much of the story is told from Rahel’s point of view, with child-like idiosyncrasy. The characters are unique and credible, though I have a lingering doubt about the fraught relationship between Ammu and her twins: why did it become so bi-polar? There is a considerable amount of scene description, such that if it were abbreviated, the book would be at least 15% shorter. But Ms Roy’s descriptive talents are so imaginative, and with some exceptions, so satisfying, that most readers will forgive her. If you know India and like India, this is a book that should be read, not because it will help one understand India today, but because it provides a context for today’s India.